This week we were lucky to get into a special preview of ‘Trainwreck’ which is due for general release on 14th August - all proceeds were to go to the Marie Keating foundation and it was obvious a few people may not have seen the warnings re ‘graphic sexual content’ as we witnessed a few grandparents fleeing with their grandchildren in tow within the first 15 minutes…..so OBVIOUSLY this film is worthy of its 16 age cert so bare that in mind parents and grandparents. If you are a fully grown adult who likes a few laughs you should go see this film and enjoy. 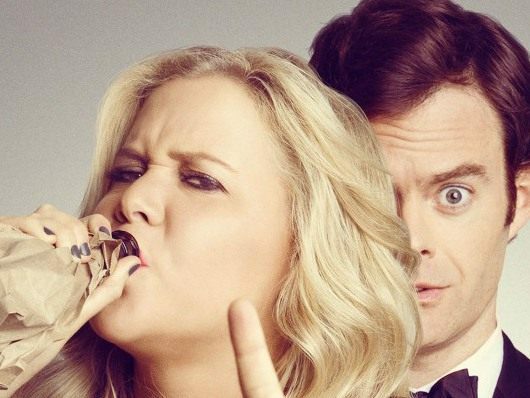 Amy Schumer wrote and stars in the film as Amy a commitment phobe young woman who is living life to the full in every sense believing that romance is something that only happens in the movies until she has to write an article for her shrill boss (played brilliantly by an almost unrecognisable Tilda Swanton) on sports doctor Aaron Connors (Bill Hader). I read a few reviews on this film and it was a very mixed bag with a lot of people commenting on the predictability of the plot which, yes is predictable but I would argue that a lot of boy meets girl films are but as I have said in the past this film is not trying to go down in the history books it is just trying to get people to laugh….well I laughed, Daithi laughed and the rest of the full cinema seemed to enjoy it also! The performances are good and I think Amy Schumer is definitely one to watch as an upcoming writer and comic. There are a few cameos to watch out for also including wrestler turned actor John Cena and Daniel Radcliffe.